On July 13, 2012, Phnom Penh Bible School (PPBS) graduated eight students for Bachelors in Christan Ministry degree and several others for associate degree. This was PPBS's 18th graduation, since the school was founded in 1992. The chairman of the board mentioned that students graduating this year are special as the school celebrates its 20th anniversary this year. Yun Rotha, one of the 8 graduates, is the first Wesleyan Cambodian pastor to graduate at PPBS. The Mission Council which, I am a part of made a decision in 2007 to send Rotha and his wife to PPBS on TOOL (Training Of Overseas Leaders) scholarship. In 2009, Rotha began his studies at PPBS. Due to limited funding, his wife was not able to study with him. Although, Rotha completed a 3-year program at the Wesleyan Bible Institute in 2007, PPBS accredit only 1 year, and had to start second year with some first year courses. After three years at PPBS, Rotha finally graduated and earned Bachelors in Christian Ministry. 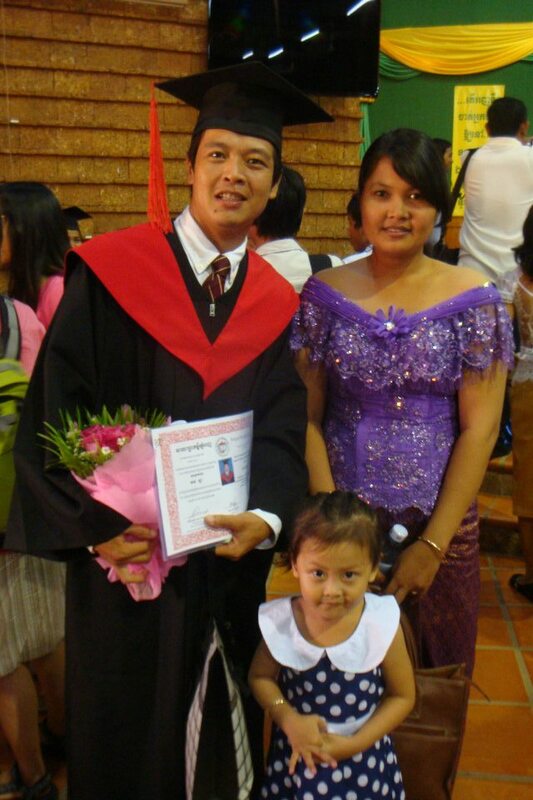 Even if I am not with the Wesleyan Church of Cambodia anymore, I am happy to see Rotha graduated. Last week he had asked me to write a recommendation letter for a job application and I was delighted to write the best recommendation I could give.